Your web browser appears to be out of date. Soon you will not be able to create a secure connection to our web site using TLS 1.0. Please upgrade your browser from current version( ). Learn more about TLS. Would You Like to Pick it up? Select your preferred location and we'll note which parts are ready to be picked up TODAY. 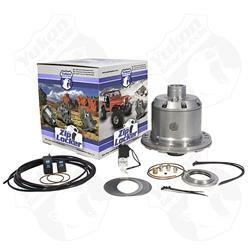 $25 REBATE on a qualifying Spartan Locker; $35 REBATE on Yukon Locking Hubs; $40 REBATE on a Yukon Driveshafts $50 REBATE on a Yukon Grizzly Locker, Zip Locker -OR- Dura Grip; $150 REBATE on a Yukon Gear Spin Free Kit - OR- on a Gear Kit Package (includes (2) Master Overhaul Kits and (2) Gear Sets!) Visit www.summitracing.com/go/yga for complete rebate details and redemption information. Valid on purchases made between 2/13/19 and 4/27/19. Claim must be postmarked by 5/11/19. Rebate will be in the form of a Visa prepaid card. This part is normally shipped directly from the manufacturer / Supplier. Order this item and get free delivery and handling on your entire order! Offer excludes truck freight and oversize fees. Valid on orders shipped in the contiguous United States. Notes: 4320 chromoly internals. Designed for 4.56 and numerically higher gear ratios. In-Store Pickup: Choose In-store pick-up (OH, NV, GA, TX) on our web site. Need traction? Zip! You've got it with Yukon Gear & Axle Zip lockers! With on-demand traction, these lockers offer an air-operated design that allows you to switch from an open differential to 100 percent lockup when you need it. Theses Yukon Zip lockers are the ultimate in driver selectability for the right traction, on-road and off. Built from forged cases with 4320 chromoly internals for added strength, they work with a variety of air-delivery systems and are assembled in the USA. Do you need gripping power--now? You have the control with Yukon Gear & Axle Zip lockers. What type of question would you like to submit? a question about this Product. There are no questions for this product. Use commas to separate multiple addresses. new parts, tools, and more! We do not sell email addresses or other private information. We're so confident in our low prices, we offer a Beat-a-Price Guarantee: We'll beat our competitors' advertised prices on any identical, in-stock product (proof of advertised price required)!